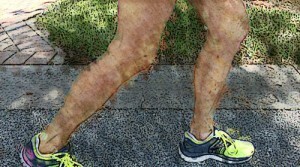 RETIREMENT COACHING – DEBBIE DRINKARD GROVUM – “Quit running and your knee will quit hurting.” Wait a minute. I was in the doctor’s office to find out what to do about the pain and stiffness I got in my right knee about an hour after I quit running, not to hear that I should give up my favorite physical activity. The doctor told me I had “old knees” and needed to find a different form of exercise. My x-rays showed mild to moderate arthritis in both knees. As soon as I got home, I researched running and arthritis and found numerous studies on reputable sites describing the benefits of running for people with mild arthritis. I started thinking about why this very competent doctor had been so quick to advise me to quit running. Perhaps he saw me as an older woman who wouldn’t mind substituting one form of exercise for another. I don’t think he saw the woman who has been running for more than thirty-five years and who values running for its mental benefits as much as for its physical benefits. I don’t think he saw the woman who was determined to do whatever necessary to continue running. And I certainly don’t think he saw the youthful inner woman who was planning to be very active for many more years. Numerous research studies have demonstrated how powerfully stereotypes and expectations affect behavior. One study compared the results of two groups of older adults taking a memory test. One group was told that because they were older they were expected to perform poorly. The other group was given the test with no information about their expected performance. Not surprisingly, the group with no expectations of poorer performance scored higher. How often are we affected by expectations-our own and others- of what we should or should not feel, desire, experience or accomplish? What can we do to minimize the effect of negative expectations? Listen to your inner voice. Does what you hear or experience sound limiting or inconsistent with what you know? Get more information. Learn as much as you can about what you want to do. Never accept a limiting message until you have thoroughly researched your options. Find role models who are defying the stereotypes and learn from them. Choose to do what you love, not what others choose for you. Take risks, not necessarily “climb-a-tall mountain kind of risk” but small, “outside-your-normal-comfort-zone risk”. Taking risks builds confidence and increases your chances of avoiding limitations. I am still running, but my exercise routine now includes less distance and frequency and more stretching, strength building and cross-training. And I expect to run for a very long time. This entry was posted in Debbie Grovum, TOPIC - Keeping Active. Bookmark the permalink.